You’ve had it happen before. You enter a room and want to turn on the ceiling fan light but instead of pulling the right cord for the light you turn the fan on full blast. Not a fun experience right. Well if you paint a simple but fun light bulb icon pull chain you will never pull the wrong cord by mistake again! 1. Working on the cardboard or self-healing mat use the craft knife to slice about ¾” off the top of a wine cork or champagne cork. A Champagne cork is larger so that is what I used, but you can substitute a wine cork and your light bulb will be smaller. 2. 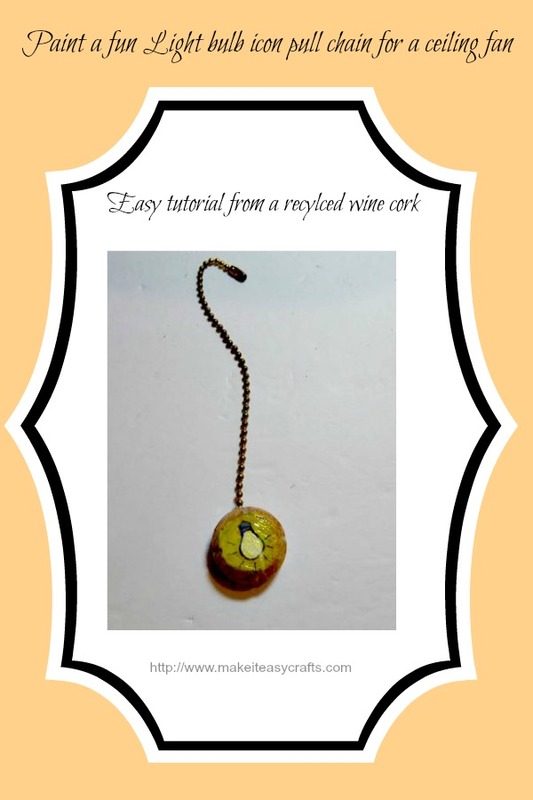 Use the sandpaper to file down any writing on the top of the cork and to make a smooth surface and remove any writing. 3. Next, use the awl or drill to make a hole in the cork. You only need to drill halfway down. Then, add a dab of tacky craft glue and push the ball chain into the hole and let dry. You are ready to add your image. 4. Using the fine line marker draw a light bulb shape on the flat side of the cork. (Pear shaped, see photo) Next fill in the bulb with white paint. Then, add the silver paint for the top of the bulb. 5. Finally outline the entire outside area of the bulb with yellow paint and let dry completely. 6. When the paint has dried, with the marker, draw some highlight lines around the bulb. Then coat the entire piece with clear finish. Let dry and attach to your ceiling fan light. We'd love to hear your comments! And please follow us on Facebook, Twitter, Pinterest, and visit Make it easy crafts each week for more quick and easy crafts, recipes, and more! I really love this idea Crystal! Thank you! Big Hugs!